Save your cash and make your own crease-removal solution. If you have ever stored your trusty denim clothing thinking that wrinkles or creases cannot set in, think again. Improper storage is generally the culprit that produces those pesky deep wrinkles. 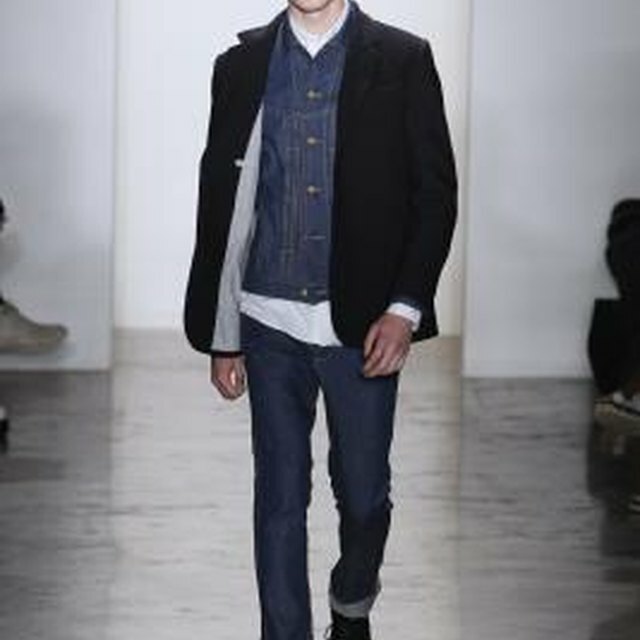 Whether jeans, jackets or shirts, cuff creases do not look fashionable unless it is part of the design. Before opening your wallet to buy specialized products, check your kitchen cabinets and make a home recipe crease-removal solution. Wash your denim with a mild liquid laundry detergent. If your garments have deep creases, laundering loosens the denim fibers and softens the crease lines. Hang the garments to air dry. Measure 1/3 cup of white vinegar in a measuring cup. Measure 1/3 cup of water in a separate measuring cup. Pour the white vinegar into the water and mix with a spoon. Pour the mixture into a spray bottle. Turn your denim garment inside out and place on your ironing board. If you have a sleeve ironing board, insert the denim shirt or jacket sleeve. Open the cuffs. If you are working with jeans that do not have stitched leg cuffs, flatten on the board. Spread out the sleeve or jacket cuff. Pull the cuff tautly on the board. Hold the spray bottle 6 to 8 inches from the denim cuff. Spray the cuffs with the white vinegar solution until the area dampens. Cover the damp cuff with a protective sheet or damp cloth. Set your iron to a cotton setting or a high-heat setting. Apply pressure with your iron over the crease and glide in a back and forth motion. Carefully lift the protective sheet or damp cloth to see if the crease has started to diminish. If the crease persists, cover the area and iron again, applying pressure over the crease. Remove the protective sheet. If the crease has significantly diminished, spray a light coating of spray starch. For most denim, hold the bottle 6 to 8 inches away from the denim and spray, allowing the fine mist to set into the denim fibers; check your denim brand for specifics. Change your iron setting to medium and repeat the process until the crease disappears. Double-check your garment for any stitched-down creases as these design details are not removable. If your denim garments have a slight odor from the white vinegar mixture and spray starch applications, wash your denim garments again and immediately hang to dry. Spray a light coating of wrinkle relaxant on stubborn creases to loosen the fibers before attempting to iron out the deep set wrinkles. Read your denim care labels. 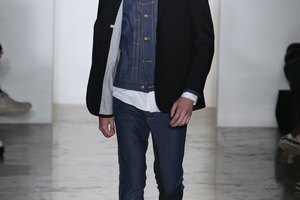 If you are working with designer denim fashions, care labels often recommend no ironing. Do not apply any product to this type of denim to avoid permanent damage. Valladares, Mercedes. "How to Remove a Cuff Crease in Denim." Synonym, https://classroom.synonym.com/remove-cuff-crease-denim-7039.html. Accessed 25 April 2019.